NEW CONTENT, NOT A REPRINT! The Monster Memories tradition at Scary Monsters magazine continues in this epic remembrance of the H.G. Wells classic The War of the Worlds. Scary Monsters carries on the 26-year tradition of issuing a yearbook of all new, all scary material! The Monster Memories Yearbook #26 for 2018 is jam-packed with nostalgic reflections of the classic films, monsters, creatures, actors, directors and stories that influenced us as kids and still do today. 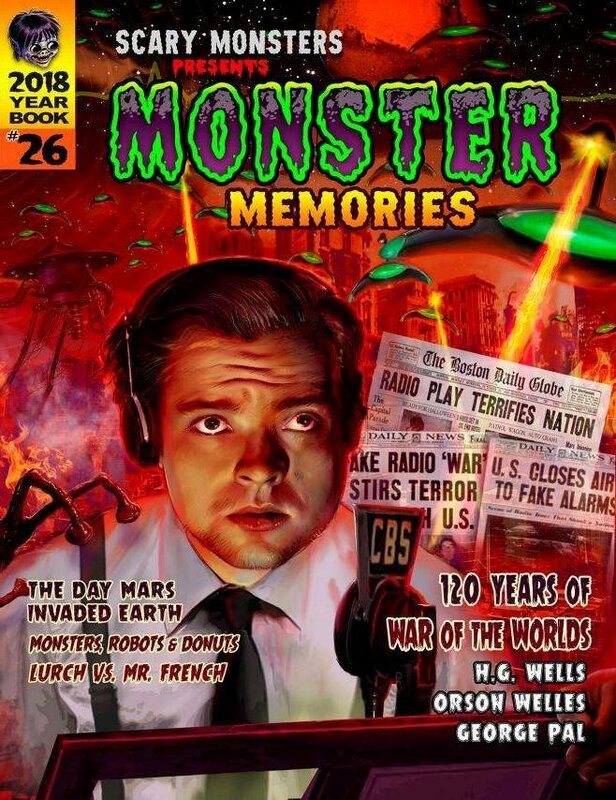 We celebrate the 80th anniversary of the Orson Welles terrifyingly believable and influential The War of the Worlds radio broadcast. We pay a visit to the sand pits of Horsell Common, the site of the first Martian landing in the H.G. Wells classic novel, and we pay homage to the 1953 classic film starring Gene Barry on its 65th anniversary... and much more. Join us in keeping classic monster memories alive!! How to Purchase: You must use the drop-down menu above to let us know whether or not you'd like to have your mag "bagged and boarded" (slipped inside an archival quality cello bag with a white backer board). This 146-page issue is now shipping and is also available at many bookstores and other outlets. Please note that, since this is an annual publication, some Barnes & Noble and BAM locations and others that normally have the quarterly Scary Monsters Magazine available may not carry it, so order your copy today. Now, here's a preview of Monster Memories #26 by our very own Dr. Gangrene!